The EHF Ordinary Congress in Vienna has come to an end. Read the complete summary of Day 2. The EHF Congress continued on 27 September 2008 in Vienna, Austria. Day 2 of the Congress belonged to the tabled motions and discussions on them. The nations voted on the adoption of motions relating to the following points. The Congress voted unanimously on adopting the first motion tabled, which relates to the recognition of EHF Statutes. The Members voted to recognise the EHF Statutes and Regulations, as well as decisions met by the EHF Bodies and pass this obligation onto their members. A further motion concerning participation in international competitions was also voted upon and passed. The basic line of the motion was to ensure that all international competitions, in particularly of a European context, take place on the basis of correct sporting qualification and are coordinated with national federations and international governing bodies. The EHF tabled a motion relating to national team competitions, with the focus at this stage on the men’s competitions. Following consultation with all stakeholders - the contribution of all parties resulted in the motion. This served as a discussion platform targeted at moulding the future shape of the European Championships and the sporting framework for national team events after 2010, which is a highly complex matter and resulted in in-depth discussions. It was agreed to dissect the motion and treat each point separately. 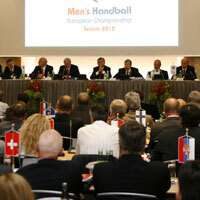 Due to the complexity of the matter, concerning scheduling and the congestion of the playing schedule across the handball stage, it was agreed to set up a Working Group with representation from all stakeholders in order to prepare the decision about the timing of the 2011/2012 Men’s European Championship by the Executive Committee. Chairman Brihault stressed that this is a “temporary solution” but the fact that this important matter requires exact coordination and precise input is essential from all parties. The Working Group will present the findings to the Executive Committee of the EHF in March for a decision. The Group will consist of Joan Marin /ESP – club system, Reiner Witte/GER – leagues, Morten Stig Christiansen/DEN – national federations and Jan Tuik – EHF Competitions Commission. Brihault will chair the Working Group. The Congress voted on the awarding process of EHF EURO events. The necessary two third majority to delegate the awarding process to the Executive was not achieved (64% in favour), therefore the Congress will continue to decide the organisers of EHF EURO events. A motion was tabled by the German Handball Federation regarding the activation of the National Team Competition Committee. This body was based on a decision decided of the Lillehammer Congress in January 2008. The Vienna Congress voted to activate this Committee, which will consist of 2 representatives of the best ranked nations (DEN, FRA), 2 EHF representatives and a fifth member to be the elected at the next official EHF conference. The Congress heard a detailed report on the forecasts for 2008 – 2009/10 by Treasurer Ralf Dejaco. The Congress accepted the adjustments of the 2008 budget and adopted the forecast budget for 2009/2010. The 2010 Congress will take place in Copenhagen/DEN on 24/25 September 2010. Cyprus announced its candidature for the 2009 EHF Conference of Presidents. The following members of the EHF were awarded for their service and dedication to the European Handball Federation. The Congress gave a standing ovation to the following persons and officially thanked them for their contribution to the sport of handball in Europe. The award for best ranked nation for both 2006 and 2007 was presented to FRANCE. The opportunity of the Congress was also used for a further nation to become signatory to the Rinck Convention which is the mutual recognition of European coaching qualifications. Switzerland became the 15th member. Georgia, Albania and Finland signed a SMART Project contract which is aimed at developing nations. The President then opened the floor for nations to introduce their own matters. Austria gave the participants information on the EURO 2010. The chair Tor Lian closed the Congress thanking the participants for their hard work, constructive discussions and input.